Pre-order bonuses are a hot button issue these days. It seems every game has some sort of exclusive item or feature that is only made available to those who pre-order it, encouraging folks to basically commit to buying a game before it even comes out. Some of these bonuses are enjoyable and substantial while others are simply pointless ways of trying to get customers to shop at a specific retailer. Occasionally these bonuses include actual levels or DLC-like content, only making them available to those who pre-order the game at a certain retail outlet which means those who pre-ordered elsewhere have to purchase the content separately at a later date. There’s also the issue of multiple pre-order bonuses at various retailers, making it hard to players to choose where to pre-order from. Is this all in the good spirit of corporate competition or are these bonuses truly detrimental to consumers? 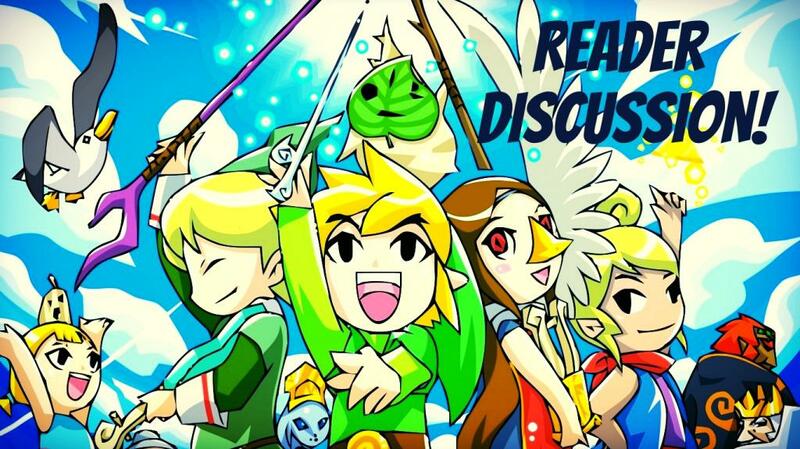 In this reader discussion Fysh and I will be answering these and more questions while sharing our opinions on pre-order bonuses. I suppose it would be most accurate to say that I have a love/hate relationship with pre-order bonuses. Let me break it down in typical pros versus cons style for your benefit, lest I ramble on for far too long (which I will probably do regardless but oh well). Pros: Pre-order bonuses draw you into a retailer and solidify your business with said retailer to an extent, so from a business standpoint they are definitely a good thing. If Amazon.com is offering up exclusive weapons or a multiplayer character skin for a game then people may feel compelled to pre-order that particular game from them, drawing in more business and making them more money. While you are probably thinking “what do I care about businesses”, keep in mind that we reap the benefits of this too; the major benefit for us being business competition. If a bonus is super awesome but exclusive to a certain retailer, others might try to make equally cool exclusive bonuses. I suppose on one hand this could be bad since it’s doubtful that we will pre-order at all the places to get all the bonuses, but on the other hand it gives us choices. I don’t believe that this hurts the consumer either considering no one is forced to pre-order a game from anywhere, regardless of how cool the bonus is, and you can always cancel if you change your mind before purchasing the game. It’s a win/win in a lot of cases. More on the consumer side of the issue, we get these cool things for free just for buying a game at a specific retailer. How awesome is that? Again, we aren’t forced to pre-order at certain places (or pre-order at all) but it’s nice to know that you will get some cool extras if you do choose to pre-order. Lastly, you can’t lose by pre-ordering stuff you would be buying anyway. I mean hey, if you were going to buy the game regardless why not pre-order and get some bonuses? Cons: Here is where it gets real iffy. Some pre-order bonuses are fair, like weapons or skins, while others such as an entire DLC are a bit cheap. It was recently announced that players who pre-order Alien Isolation at GameStop will get exclusive access to a side campaign based on the Alien movie. While on this surface this seems awesome, especially if you pre-ordered or planned to pre-order at GameStop, but it’s really not. This isn’t just a gold pistol or costume for a character, it’s basically an entire DLC campaign for free while others have to pay for it at a later date. I don’t even think it would be as big of an issue if it wasn’t a game that people are feeling unsure about based on the last Alien game. Maybe it wouldn’t be a problem if it was a game like Destiny that people are pretty sure they will buy the crap out of, but it’s a game coming from a line of games that has been disappointing at best. This one particularly affects me considering I despise GameStop, so pre-ordering there is a rarity if ever done at all, and I end up missing out on these huge pre-order bonuses. It all comes down to missing out on something big because you aren’t sure if you even want the game or if you want to pre-order at a certain place. These aren’t all the pros and cons of course, but they are the most pertinent as they are the definition of my love/hate relationship with pre-order bonuses. To put it simply: I love getting cool things when I pre-order but I hate being compelled to pre-order a game because I don’t want to pay for DLC later on down the line. An article I read recently argued that we the consumer lose when we pre-order as we lock in our sale and are committing to purchasing a game before reviews are released. To be honest, the article makes some good points but I hate that the author dwells on the fact that we the consumer are basically too stupid to make our own decisions about buying games and that we should be letting reviews make that decision for us. I say if you want a game enough, maybe you have watched some trailers or read some articles that piqued your interest, then you shouldn’t feel bad about pre-ordering or purchasing a game before reviews are out. I think reviews should always be taken with a grain of salt for various reasons which I wont get into right now (future article idea?) but mainly we should never let them make decisions for us. I’ve loved games that have gotten negative reviews and hated games that got positive reviews. Make your own choices people, I promise that with an informed opinion, you cannot lose when purchasing a game (unless you are lied to *cough*Aliens: Colonial Marines*cough*, but you can’t help that). Back on subject though, as I have indeed rambled on for too long despite my best intentions, pre-order bonuses are both good and bad and ultimately the decision lies with the consumer, pre-ordering and buying games is up to you regardless of the bonuses so make wise choices. Don’t get suckered in to pre-ordering solely due to a cool bonus but don’t be so cynical that you wont pre-order and end up missing out on a neat extra. My views on pre-order bonus offers are very self oriented, but for the purposes of discussion I will branch out my thoughts regarding them to try to take a broader point of view. To start, my position has always been this: if a company wants to give me “extra” content for free just for buying a game I want, then I am all for it. I do not pre-order games that I do not fully intend to buy and I always do a lot of research on the games that I intend to purchase. I have very rarely ever been displeased with a game I pre-ordered. I understand that not everyone is as confident in their assessment of a game prior to its release, and perhaps some people don’t want to research a game before they buy it. In these cases, pre-order incentives may entice them to make a decision about buying a game before becoming informed about the game. It is important to remember that a pre-order is not a contract, and can be cancelled at any time in most cases. It is also important to recognize these bonuses as what they are: incentive for consumers to purchase a game. In the majority of cases, these bonuses are not made with the idea of enriching your gameplay experience, they are made as an afterthought to add perceived value to a purchase. It is the same issue that I have with DLC in general. This content may be just as easily included in the game at no additional charge in the first place, but it is easy to remove it and use it instead as an incentive to pre-order. It is true that this is not always the case, but it is a mindset that publishers and retailers will readily take as business strategies. On the other hand, when the bonus content that is actually well though out and proper additional content, it can be a great bonus to a purchase that an informed consumer would make. The bottom line is that you can avoid this problem entirely by being confident in your decisions as a person who purchases games. It can be safely assumed that if a pre-order bonus consists of meaningful content it will become available at some point regardless of retailer exclusivity at the time of release. The only risk you are taking is between purchasing the game before having a solid amount of information, or having to pay for the additional content. In some cases you may be able to pre-order a game and receive the bonus before the purchase is actually made, in which case you are free to cancel the pre-order and still keep the bonus. I personally don’t allow these bonuses to have any weight on my decisions to purchase, other than which retailer to purchase them from. Even then, in most cases I still choose my preferred retailer. It is all in your hands to inform yourself and make decisions you are confident in for the right reasons. With these ideas in mind, there really is no harm in pre-orders bonuses. WE decide how much power these bonuses have. If we can keep that in mind, then we have nothing to fear. What are your thoughts on pre-order bonuses? Are they inherently positive or negative in your opinion? Do they make you more inclined to pre-order a game/have weight on your purchase decisions? Would a really cool bonus convince you to pre-order a game even if you aren’t sure about the game itself? I hate it with a passion. I was mostly okay with physical rewards that everyone got for a physical preorder, but the move to digital has created a dangerous trend toward exclusive content. I really don’t want to see non-cosmetic content become a common occurrence, as I really hate any DLC or character freebies for preordering from one specific retailer. 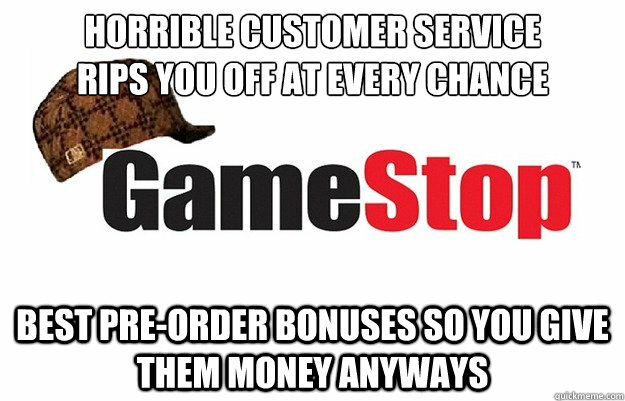 I really dislike Gamestop, and I try not to patron them every chance I get. I hate GameStop as well, I do my best to not support them with my money. I agree with your point too, the trend of exclusive content as a pre-order bonus is getting crazy. I might be okay with an industry standard time lock and then it’s free for everyone approach, but that’ll never happen. I hate the idea of Gamestop specifically assisting in the development of exclusive preorder content. It was fine when I could passively aggressively ignore cosmetic bonuses, but throw in a little added cash, and Gamestop might convince devs/pubs to do more substantial preorder bonuses on a regular basis.